Every year, we send out a mail to all our participants from the previous year, telling them that the registrations to join the 'One Day, One Story' campaign have begun. 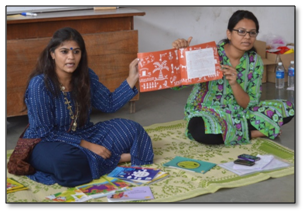 This year, after we mailed them, we reached out to Renu Seth and Aditi Macwan from the Pratham Gujarat team, she asked if we could arrange for a resource person to conduct a storytelling workshop before the event. "... this is just an opportunity to make our teams even better story tellers, for them to be able to do a lot of story telling in classes and also create greater awareness in the early childhood centres by involving the government teams that are in charge of Anganwadis in city", said Renu. Renu adds - "As we have conducted orientations for Anganwadi workers of Ahmedabad (urban and rural) we thought that if they also understood the importance of story telling, and its impact - and that story telling can be done in different ways - using art and activities that help children talk about the story, and, how stories can be invented from the doodles and pictures made by children - it would make story telling in class happen in the true spirit. Sometimes, these small 'how to do' sessions act as a support and encouragement for many of us." Thank you Renu and Aditi for extending this campaign and involving many more educators and to Shefali for adding the 'masti' to this workshop. We look forward to hearing all your stories this year.